Add a classy touch to your holiday décor with this beautifully made Christmas tree embroidered stocking this holiday season and enjoy FREE personalization. Fabulously designed and beautifully crafted, this embroidered stocking is the perfect addition to your holiday home. Created from delightful red velvet and festive gold trim, this Christmas stocking is topped with a cheerful green cuff and an applique tree for an old fashioned holiday appeal. Choose to have your stocking personalized with gorgeous gold embroidery for a customized touch that is certain to impress. Measuring approximately 19 inches long and 8 inches wide at the cuff, there is enough room for all your favorite holiday goodies. 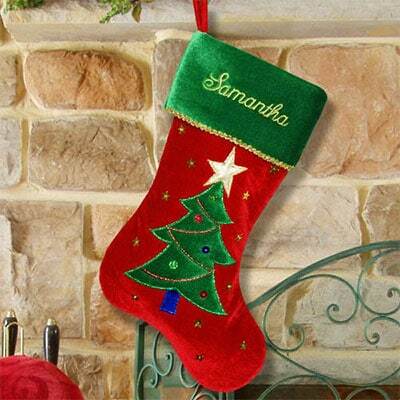 Order an embroidered stocking for each member of your family to create a truly wonderful holiday display. At just $19.98 this stocking is a must have this year.